If you prefer, you can finish this tutorial using the Azure CLI or Azure PowerShell. On the upper-left side of the screen, select Create a resource > Networking > Route table. Resource group Select Create new, enter myResourceGroup, and select OK. Location Leave the default East US. BGP route propagation Leave the default Enabled. In the portal's search bar, enter myRouteTablePublic. When myRouteTablePublic appears in the search results, select it. In myRouteTablePublic under Settings, select Routes > + Add. Next hop type Select Virtual appliance. Next hop address Enter 10.0.2.4. Before you can associate a route table to a subnet, you have to create a virtual network and subnet. On the upper-left side of the screen, select Create a resource > Networking > Virtual network. Resource group Select Select existing > myResourceGroup. Subnet - Name Enter Public. Subnet - Address range Enter 10.0.0.0/24. Leave the rest of the defaults and select Create. In the portal's search bar, enter myVirtualNetwork. When myVirtualNetwork appears in the search results, select it. 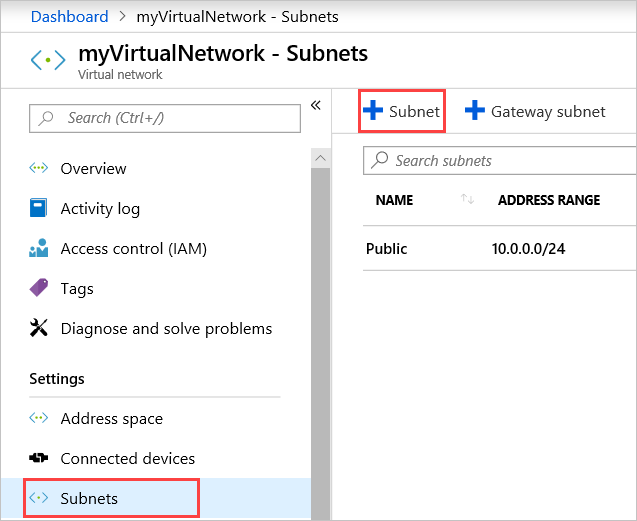 In myVirtualNetwork, under Settings, select Subnets > + Subnet. Leave the rest of the defaults and select OK.
Like the last time, leave the rest of the defaults and select OK.
Azure shows the three subnets: Public, Private, and DMZ. In Public, select Route table > MyRouteTablePublic > Save. NVAs are VMs that help with network functions like routing and firewall optimization. You can select a different operating system if you want. This tutorial assumes you're using Windows Server 2016 Datacenter. On the upper-left side of the screen, select Create a resource > Compute > Windows Server 2016 Datacenter. Virtual machine name Enter myVmNva. Availability options Leave the default No infrastructure redundancy required. Image Leave the default Windows Server 2016 Datacenter. Size Leave the default Standard DS1 v2. Username Enter a user name of your choosing. Public inbound ports Leave the default None. Already have a Windows license? Leave the default No. In Create a virtual machine - Disks, select the settings that are right for your needs. Virtual network Leave the default myVirtualNetwork. Public IP Select None. You don't need a public IP address. The VM won't connect over the internet. Leave the rest of the defaults and select Next : Management. In Create a virtual machine - Management, for Diagnostics storage account, select Create New. Account kind Leave the default Storage (general purpose v1). Performance Leave the default Standard. Replication Leave the default Locally-redundant storage (LRS). Select Review + create. You're taken to the Review + create page and Azure validates your configuration. When you see that Validation passed, select Create. The VM takes a few minutes to create. Don't keep going until Azure finishes creating the VM. The Your deployment is underway page will show you deployment details. When your VM is ready, select Go to resource. Turn on IP forwarding for myVmNva. 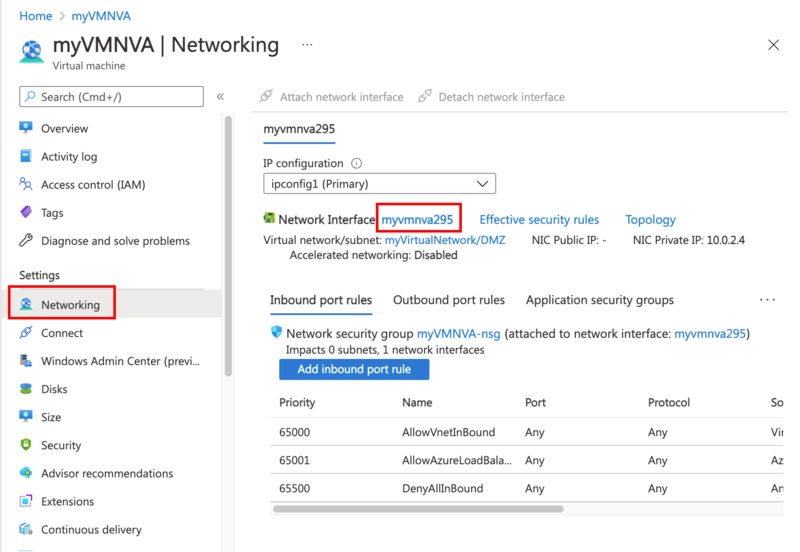 When Azure sends network traffic to myVmNva, if the traffic is destined for a different IP address, IP forwarding will send the traffic to the correct location. On myVmNva, under Settings, select Networking. Select myvmnva123. That's the network interface Azure created for your VM. It will have a string of numbers to make it unique for you. Under Settings, select IP configurations. On myvmnva123 - IP configurations, for IP forwarding, select Enabled and then select Save. Create a public VM and a private VM in the virtual network. Later, you'll use them to see that Azure routes the Public subnet traffic to the Private subnet through the NVA. Virtual machine name Enter myVmPublic. Public IP address Accept the default. Public inbound ports Select Allow selected ports. Select inbound ports Select HTTP and RDP. Diagnostics storage account Leave the default mynvastorageaccount. Virtual machine name Enter myVmPrivate. 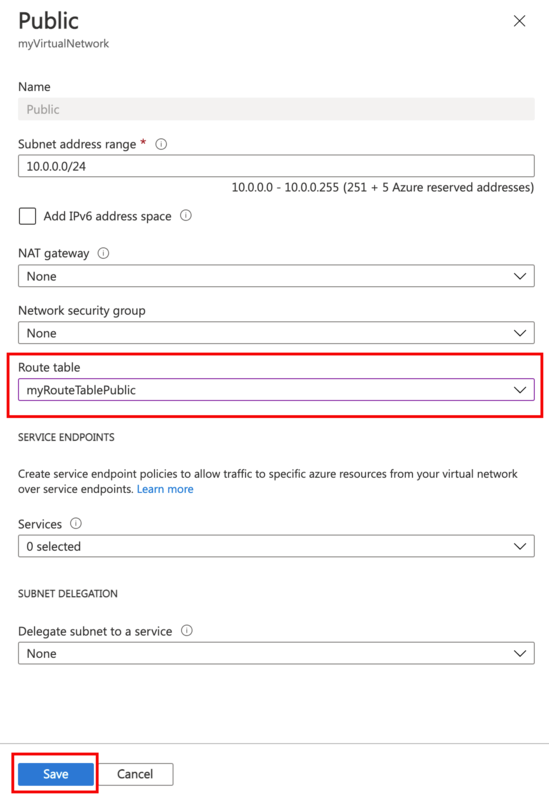 You can create the myVmPrivate VM while Azure creates the myVmPublic VM. Don't continue with the rest of the steps until Azure finishes creating both VMs. In the portal's search bar, enter myVmPrivate. When the myVmPrivate VM appears in the search results, select it. Select Connect to create a remote desktop connection to the myVmPrivate VM. In Connect to virtual machine, select Download RDP File. Azure creates a Remote Desktop Protocol (.rdp) file and downloads it to your computer. Enter the user name and password you specified when creating the Private VM. You may need to select More choices > Use a different account, to use the Private VM credentials. You may receive a certificate warning during the sign in process. Select Yes to connect to the VM. In a later step, you'll use the trace route tool to test routing. Trace route uses the Internet Control Message Protocol (ICMP), which the Windows Firewall denies by default. Enable ICMP through the Windows firewall. In the Remote Desktop of myVmPrivate, open PowerShell. You're using trace route to test routing in this tutorial. For production environments, we don't recommend allowing ICMP through the Windows Firewall. 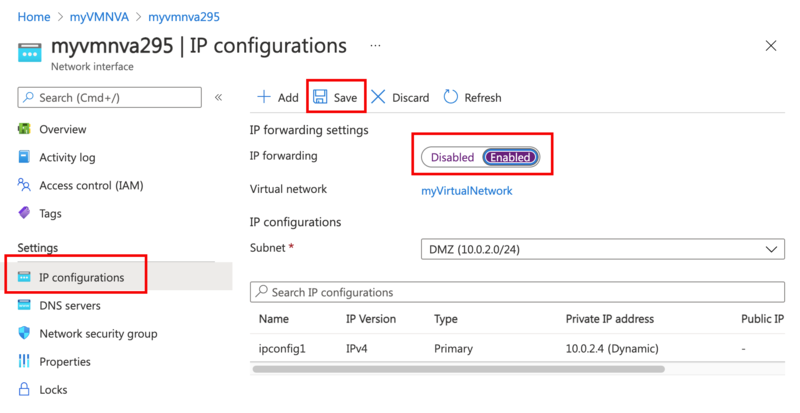 You turned on IP forwarding for the VM's network interface using Azure. The VM's operating system also has to forward network traffic. Turn on IP forwarding for myVmNva VM's operating system with these commands. Restart the myVmNva VM. From the taskbar, select Start button > Power button, Other (Planned) > Continue. That also disconnects the remote desktop session. In the Remote Desktop of myVmPublic, open PowerShell. First, let's test routing of network traffic from the myVmPublic VM to the myVmPrivate VM. You can see the first hop is to 10.0.2.4. It's NVA's private IP address. The second hop is to the private IP address of the myVmPrivate VM: 10.0.1.4. Earlier, you added the route to the myRouteTablePublic route table and associated it to the Public subnet. As a result, Azure sent the traffic through the NVA and not directly to the Private subnet. Close the remote desktop session to the myVmPublic VM, which leaves you still connected to the myVmPrivate VM. You can see Azure routes traffic directly from the myVmPrivate VM to the myVmPublic VM. 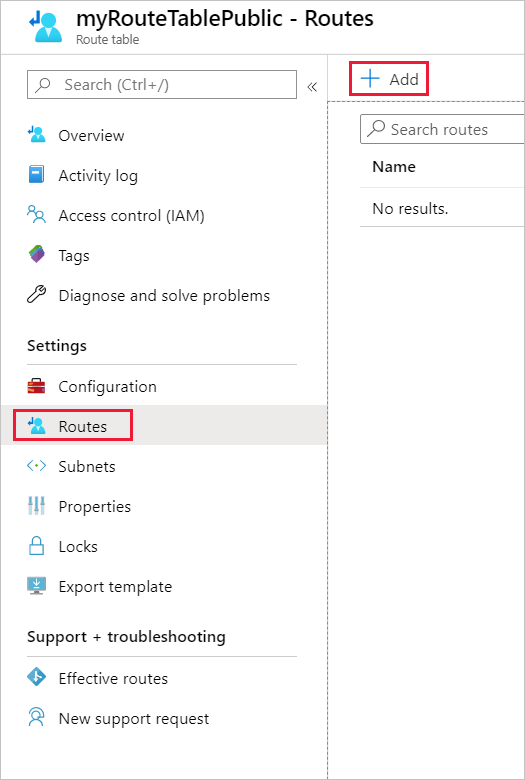 By default, Azure routes traffic directly between subnets. Close the remote desktop session to the myVmPrivate VM. In the portal's search bar, enter myResourceGroup. When you see myResourceGroup in the search results, select it. In this tutorial, you created a route table and associated it to a subnet. You created a simple NVA that routed traffic from a public subnet to a private subnet. Now that you know how to do that, you can deploy different pre-configured NVAs from the Azure Marketplace. They carry out many network functions you'll find useful. To learn more about routing, see Routing overview and Manage a route table. While you can deploy many Azure resources within a virtual network, Azure can't deploy resources for some PaaS services into a virtual network. It's possible to restrict access to the resources of some Azure PaaS services. The restriction must only be traffic from a virtual network subnet though. To learn how to restrict network access to Azure PaaS resources, advance to the next tutorial.